Leave your worries at the Clubhouse and step onto 700 gently rolling acres of golfing perfection. Towering pines, expansive fields of native Bluestein grass and the shimmering waters of Lake Oconee combine to create a serene landscape. But don’t be fooled—this beauty is demanding. Each hole was cleverly designed to require cunning strategy and precise execution. Whether you play it safe or take a more aggressive angle to the hole, you’ll face the consequences of every stroke. 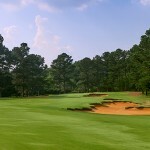 Brought to life during the golden age of course architecture by greats Crenshaw and Coore, The Golf Club at Cuscowilla is truly a different course every time you play—satisfying first timers and long-time residents alike.